RF and mixed-signal intellectual-property (IP) technologies benefit from real growth, rumors of Apple’s WiFi chips, and MEMS. The wireless chip market will be the leading growth segment for the semiconductor industry in 2013, predicts IHS iSuppli Semiconductor. The report states that original-equipment-manufacturer (OEM) spending on semiconductors for wireless applications will rise by 13.5% this year to reach a value of $69.6 billion - up from $62.3 billion in 2012. Another sign of the dominance of wireless systems comes from Will Strauss, President & Principal Analyst of Forward Concepts. “There is a rumor ‘published’ in Israel that Apple will be designing its own baseband and WiFi chips. When Texas Instruments dropped out of the cellphone business, within a week about 100 of the former TI engineers in Israel were hired by Apple. The design and development of wireless and cellular chips reflects a continuing need for related semiconductor IP. All wireless devices and cell phones rely on RF and analog mixed-signal (AMS) integrated circuits to convert radio signals into digital data, which can be passed to a baseband processor for data processing. That’s why a “wireless” search on the Chipestimate.com website reveals list after list of IP companies providing MIPI controllers, ADCs, DACs, PHY and MAC cores, LNAs, PAs, mixers, PLLs, VCOs, audio/video codecs, Viterbi encoders/decoders, and more. Wireless has helped drive the growth of many industries - most notably, microelectromechanical-systems (MEMS) technology. The growth in RF MEMS could be considered “old news,” except that IP in sensors and signal-conditioning subsystems has been growing rapidly, thanks to smart phones, game interfaces, and tablet sales. Wireless technology is the focus of several major upcoming conferences. In addition to this week’s Mobile World Conference, next week’s DVCon event has a session dedicated to Mixed-Signal/Power Aware Design and Verification. There is no escaping the importance of wireless and AMS IP in today’s SoCs. 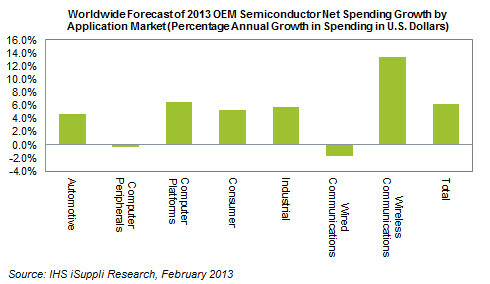 Wireless chips will continue to lead semiconductor growth for many years to come. IP Insider‘s John Blyler and Chipestimate.TV‘s Sean O’Kane interview AWR (National Instruments) and Agilent and talk about cool technology. John interviews Sherry Hess, VP with AWR – a National Instruments company – about software piracy. Sean and John talk about what’s unique at DesignCon 2013, including Tek, Cast, SiSoft, and others. Sean interviews Doru Popescu, Agilent Technologies, about technology and real vs. virtual trade shows. Lani Wong's in the camera. How does she do that? The Chipestimate.TV camera crew in action. Nice job, guys! New CMOS-based imagers offer smaller size and cost, but with greater discriminating powers over today’s RGB-based cameras. Imec, a major researcher in nanoelectronic technology, has announced an evaluation kit for its compact, low-cost, CMOS-based hyperspectral imaging filter system. Hyperspectral technology provides images with greater detail than traditional-visible-spectrum Red-Green-Blue (RGB) camera systems. This additional detail permits the human viewer or machine system to “see” more details about the image (i.e., the materials that make up the image). Application areas for hyperspectral imaging include the medical, optical sorting, remote sensing, and even agricultural markets. How does spectral imaging differ from basic camera systems? The human eye sees visible light in three bands – red, green, and blue. Hyperspectral imaging extends the visible bands into a much wider spectrum, which results in a more complete identification of the materials that make up the scanned object than RBG-based camera systems. Today’s bulky hyperspectral imaging systems are compared to Imec’s CMOS-based compact camera system. Imec developed the CMOS-based sensor-imaging chip by tiling hyperspectral filter sets onto the sensor chip. In other words, it processes the spectral filters directly on top of the CMOS image sensors at the wafer level. Hyperspectral sensors can be tailored to specific customer requirements during the filter’s design phase. This approach greatly reduces the size and cost of the overall hyperspectral imaging systems. The resulting camera is able to acquire real-time hyperspectral video. How does this new sensor impact the world of semiconductor IP? Spectral imaging technology will compete with today’s existing visible RGB-based sensors. This means that new hyperspectral imaging software and algorithms will be needed (e.g., in analogy to current color-correction matrices as offered on Chipestimate.com). Color-correction software is needed to eliminate the color overlap created by most RGB-based channels. Imec demonstrated these imagers in addition to the evaluation/demonstration board systems at the recent SPIE Photonics West show. You are currently browsing the JB's Circuit blog archives for February, 2013.